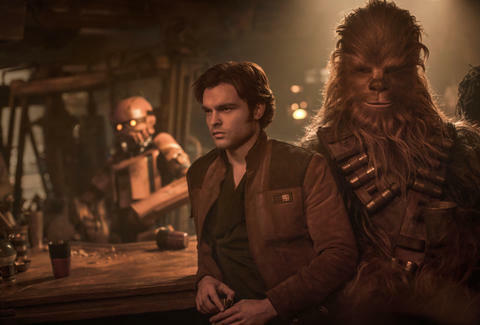 Solo: A Star Wars Story is catnip for longtime fans of the franchise. The Ron Howard-directed, Lawrence Kasdan-written origin story rolls through a long list of things to learn about Han Solo (Alden Ehrenreich), the vest-wearing Corellian smuggler who has been dominating pop culture for f40+ years. He won the Millenium Falcon in a bet? He made the Kessel Run in under 14 parsecs? He knows that a parsec is a measurement of distance and not time? All is finally revealed, whether you needed it or not. Turns out Han Solo doesn't just understand the Wookiee language, Shyriiwook, he can speak (er, growl) it, too. Chewbacca (Joonas Suotamo) has a great meet-cute with the young Han Solo when our scrappy, thieving hero gets tossed into a pit by a pair of Imperial agents, to be fed to "the beast." It's shades of the Rancor under Jabba's Palace from Return of the Jedi, but the instant we see the quality of the monster's fur, we know these two are going to become best buds for life. And to the main event: Han gets separated from the love of his life, Qi'ra (Emilia Clarke) and it takes years for them to get back together. By the time this happens, he's literally been through a war and now under the wing of contract thief Tobias Beckett (Woody Harrelson), and Qi'ra is the kept woman of a nasty kingpin called Dryden Vos (Paul Bettany). There's a lot of money in it for our gang if they can deliver two suitcases of MacGuffin Sauce in under X amount of hours. They can do it! But first they need a ship. That's where Lando Calrissian (Donald Glover doing an eerily perfect Billy Dee Williams impersonation) comes in. Lando, as we all know, is super-cool, and when Han is in his orbit, he's the lovable doofus. It's a great pairing. But Ehrenreich is coming into this movie with a handicap; there is only one Harrison Ford. Unlike Glover, who is an instant fit, Ehrenreich's Solo only works when you stop trying to think of him as the real Han Solo. When he's just a fun, cocky ruffian who manages to smile his way out of tricky situations, it works. Plus, he's got Chewbacca right next to him, and it's so much fun to see the pair of them in the cockpit of the Falcon. The finer points of Solo's plot aren't worth getting into; by tomorrow, I'll have forgotten it. There's a lot of chasing, that much I can tell you. Emilia Clarke wears some sharp-as-hell, art deco-inspired outfits. More importantly, there's the creature and droid effects, which are, without question, the best in any of the recent Star Wars movies. There are two-and-a-half Cantina-type scenes, and they're wall-to-wall weirdo aliens with crazy looking eyeballs all over the place. There's one droid that looks like an enormous British AC power plug. In broad strokes, the stakes in Solo are super-low and the plot is a little bit incomprehensible, but when everything moves so fast, it's hard to care. Maybe it's more apt to say it's easy to allow yourself not to care. One thing I wasn't expecting is just how much of a relief it is to see a Star Wars film without the Force or those dreary Jedi or that stick-in-the-mud Yoda babbling on about "destiny" and "the Dark Side." This is a heist picture with cool costumes and lots of zooming. Solo is zippy and light and bursting with visual appeal, and there's really nothing wrong with that. There's also the implication that more movies in this specific timeline are on their way. Considering how brooding the main trilogy is, a lighter, less-serious set of films seems like the right move. In our current culture, there's never a new Star Wars movie that's far, far away.